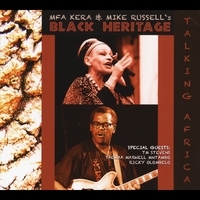 Talking Africa by Mfa Kera & Mike Russell's Black Heritage is the music of impassioned musicians. Listen to the song 21 Years and feel the urgency of the vocals as Mfa Kera and Mike Russell take flight. If you enjoy serious music and meaningful lyrics then this release is a must have addition to your music library. Talking Africa is pulsating with hits for a global audience. Scintillating vocals and beats for everyone. An album that is highly recommended for its experiences and experiments in jazz/blues/cultural music. Seasoned vocals and sharp instrumentation meshed nicely on all of the songs. see the group live -- the experience is even better.